Oh, what I would not do to be a Sherlockian. How I would love to be all Nerdist-like towards the BBC version of Elementary known as Sherlock. * I suppose it would be wonderful to praise anything that came from the production duo of Mark Gatiss and Steven Moffat. 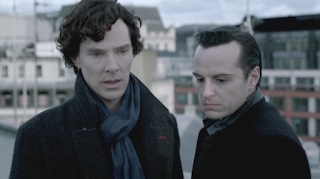 The Reichenbach Fall, Sherlock's season/series finale, has been hailed as one of the greatest versions of Sir Arthur Conan Doyle's The Final Problem ever made. I thought from start to finish it was absolute rubbish, nonsensical rather than intricate, camp rather than deep (mostly), and just something that pseudo-intellectuals will praise because they are just too embarrassed to say the Emperor has no clothes. 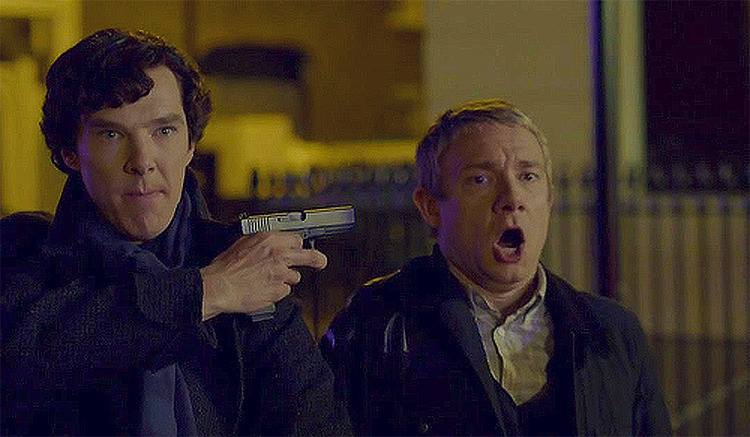 The Reichenbach Fall is a story that doesn't make sense and which not only left me cold, but left me in shaking fury at both how wildly overpraised Sherlock in general is but confounded as to why critics in general and Sherlockians in particular can be in fits of tears over all this. John Watson (Martin Freeman) returns to his therapist, devastated by the death of his friend, Sherlock Holmes (Benedict Cumberbatch). Three months earlier, Sherlock had been hailed as a hero for having recovered the Reichenbach Fall painting. His notoriety has made both Holmes and Watson (who constantly tells Holmes how to behave in public) uncomfortable, his groupies becoming too fervent in following his adventures. One person who is not a groupie is Jim Moriarty (Andrew Scott), who sees himself as a master 'consulting criminal'. He comes up with a dastardly plan to top all dastardly plans: he will break into three locations at the same time: the Bank of England, Pentonville Prison (or rather, break inmates out), and the Tower of London, where he will steal the Crown Jewels. A stunned and overwhelmed Detective Inspector Lestrade (Rupert Graves) finds it all too impossible to believe, especially the part where Moriarty, rather than attempt to flee, sits campily on the throne and awaits them. I'd like to stop now and ask, 'has anyone ever come up with something so brilliant as the criminal letting himself be captured?' Why didn't anyone think of this plot device before? The trial of the century begins, and Holmes, unable to stop himself, begins deducing unpleasant things about the jurors and the intrepid reporter Kitty Reilly (Katherine Parkinson), whom Holmes tells, "You repel me," due to her insistence on getting the truth about the Great Detective. To Holmes' surprise, his arrogance gets him locked up for contempt, with none other than Jim Moriarty. To the surprise of everyone, despite mounting no defense Jim Moriarty is found not guilty. Perhaps to gloat, perhaps to give Holmes something to do, Moriarty pays a call on the Great Detective, taunting him with news that the whole trial was a set-up to attract clients for Moriarty and show how powerful he can be. However, Moriarty has yet to solve 'the final problem' between him and Sherlock. We then go to the abduction of the U.S. Ambassador's children. Holmes uses his skills to find the children in time, and even finds that the children, like in Hansel and Gretel, have left both clues and eaten too much candy, candy which will poison them. The boy is in intensive care while the highly traumatized girl is conscious and recovering from her trauma. When Holmes goes in to question her (having been highly warned not to 'be himself'), the girl screams in horror. Based on the child's reaction and the fact that all Holmes needed to solve the case was a footprint, Sergeant Sally Donovan (Vinette Robinson) comes to the brilliant deduction that Sherlock Holmes not only committed this particular crime, but has created Jim Moriarty and perpetrated all the other crimes he solved (a criminal version of Munchausen Syndrome By Proxy if you will). Donovan and Anderson (Jonathan Aris) pressure Lestrade to arrest Holmes for the kidnappings, and a shocked Sherlock finds that Moriarty has planned all this out in order to discredit Sherlock and have the world believe he's a fraud. Watson by now has learned from Mycroft (Mark Gatiss) that there are four assassins living within walking distance of 221 B Baker Street and that Mycroft gave too many details of Sherlock's life to Moriarty while the latter was in custody. This comes to light when Kitty has an exclusive involving...Moriarty, who has been hiding out in her home. Holmes and Watson, having escaped custody through a comedy routine, find that Kitty is now ready to enact revenge on being spurned by Holmes thanks to Richard, or Rich, Brooks, who says he is an actor hired by Holmes to 'play' Moriarty and with evidence to prove so. Holmes finds that no one save John will believe him, so he turns to Molly (Louise Brealy), the lab assistant Holmes constantly ridicules but who carries a torch for him, asking for her help. Watson has already left to confront Mycroft for his stupidity, and a final confrontation with Moriarty takes place atop the hospital. In some duel of wits Moriarty tells Sherlock he must kill himself, otherwise the assassins will take out John, Mrs. Hudson, and Lestrade. Oddly, Moriarty does not hire a hitman to take care of Sherlock's brother but does hire a hitman to kill the man who didn't believe Sherlock was telling the truth and is pursuing to arrest him for fraud, kidnapping, and other high crimes and misdemeanors. Curious, that. In order to stop Sherlock from breaking him, Moriarty shoots himself in the mouth, killing himself instantly. A tearful call from Sherlock to John, and we see Sherlock Holmes jump to his death, John temporarily knocked down as he goes to see his friend. The Reichenbach Fall ends with John and Mrs. Hudson, mourning at the grave of Sherlock Holmes, while in the shadows, Sherlock Holmes himself sees them at his own grave. I WON'T accept the premises you've given me. My mind does not operate that way. I know one has to have some suspension of disbelief, but what The Reichenbach Fall asks me to do is to simply not think at all. From the get-go the story is so patently idiotic I simply am astonished that so many people think this is some masterwork of television writing. Let's take just a couple of examples where I said to myself, NO, NO, NO! Example One: the Donovan Situation. If I believed Steve Thompson's story I have to accept that Sergeant Donovan could have come to such a wild conclusion based on the flimsiest of reasons. Having endured Sherlock for two years (at the least), she would have grown accustomed to how quickly he could come to conclusions based on really small clues. She has endured his ridicules of her intellectual weakness, but now she believes she has come to the right conclusion based on a screaming girl and what basically is professional jealousy. 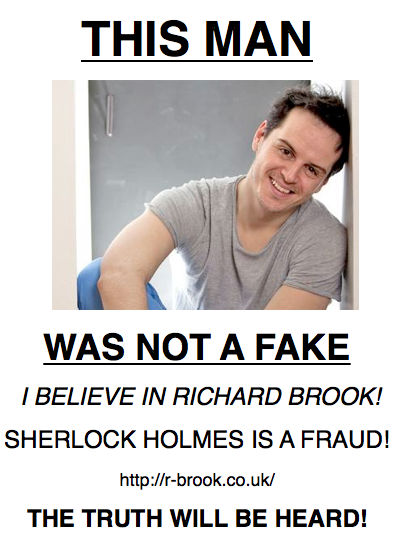 Donovan has worked with (and suffered) Sherlock for too long to be so easily taken in with no proof. "Oh, he just solves things too easily, so obviously he planned the whole thing." This is patent nonsense. There is no proof (apart from a highly traumatized child) to link Sherlock to any crime, so how in tarnation could she have leaped to such a wild (and unproven conclusion)? Furthermore, I never believed that Lestrade, who has worked with Sherlock on many occasions (such as the Affair of the Hound) could have so easily crumbled under the paper-thin pressure of Donovan and said, "Oh yes, of course. Because he reaches the right conclusions faster and more accurately than all of us, he obviously committed the crimes he investigated (and that I investigated with him)". Example Two: Rich Brook. First, I know I am not in the higher echelons of intellectuals, but there are some of us who do not speak German (I do happen to speak Spanish, some French, and am working on Italian). Therefore, the "Rich Brooks" business would fly over us, and I always think it's unfair to not give us the information to reach a conclusion. Be that as it may what really appalls me about this is that it makes no sense. There is no way that this would be possible. 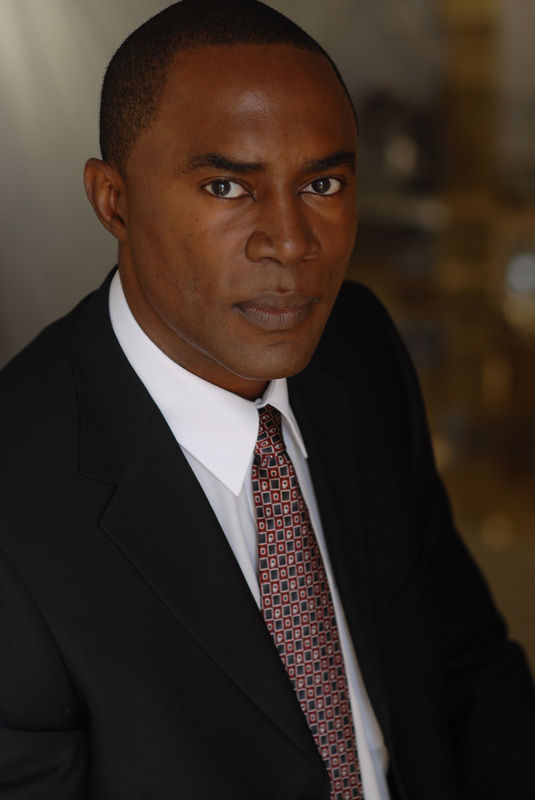 If "Rich Brook" were a real person, wouldn't ANYONE have noticed that this 'actor' was on trial? It is possible for Sherlock to live in a vacuum, but for everyone else to is patently absurd. Watson and Mrs. Hudson know who some chat-show hostess was, but I am suppose to believe that a children's television host (complete with DVDs) known as The Storyteller would be so completely obscure that no one on the jury or those following the news would NOT recognize him? All I kept thinking was, all this News of the World-type journalist had to do was contact the British version of Actors Equity or the Screen Actors Guild to verify whether Rich Brook was real. No, instead I'm suppose to believe that this reporter, looking for her first scoop, accepts the word of some random person who comes up and tells her, "Oh, Sherlock Holmes hired me to be this master criminal but I'm really a children's television host even though I can't actually produce any of the DVDs that I say I have made or provide any footage of the various television or even theater work I claim to have made." How STUPID do Steven Moffat, Mark Gatiss, and Thompson think I am? Well, I think they know that Sherlockians who aren't as obsessed about things like logic (vast experience on Doctor Who has taught them fans don't really care about such things) are simply too wrapped in the emotion and fast thrills they throw at them to really care whether any of this makes sense. I could come up with other examples (Mycroft, this master of deviousness, being so careless as to tell Moriarty All About Sherlock; the police higher-ups infuriated about an amateur being part of investigations despite being at and being singled out at police press conferences) but in short in terms of story, The Reichenbach Fall is all garbage, illogical to the point of insulting. If anything really saves The Reichenbach Fall from being an unbearable disaster, it is the performances of the three main characters. This certainly has been Freeman's best hour as he managed to get away from the bumbling befuddled Watson and into the loyal (read, only) friend the arrogant prick of Sherlock has. From his genuine mourning for Sherlock to his fury at Mycroft, Freeman does wonders with the role. Same goes for Scott, particularly in the 'Rich Brook' scene, where he goes all-out into making this shamefully idiotic scenario possible. Cumberbatch had a full range to which work with. He has specialized in making Sherlock Holmes into an obnoxious, arrogant, cruel prick (his scene with the jury is a best/worst-of Holmes' horrid manners and curt behavior). However, by the end, I am sure I saw a tear from him when he calls Watson. Has Sherlock Holmes inched his way into humanity? I think I will give The Reichenbach Fall a point for every good performance. In all other respects, it is rather insulting to the audience, but fortunately for Sherlock, its fanbase simply doesn't care about things like logic. I find that quite ironic: that a show based on a 'cold, logical thinking machine' is one that does nothing but play on emotion. Would The Great Detective have approved? * Yes, I know Sherlock came before Elementary. However, having seen two seasons of both, I can't help making a joke spoofing Sherlockians fixation on a show they see as a rip-off of their own.